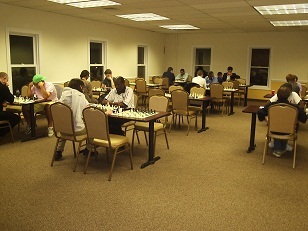 There were many winners at the Chess Club of Fairfield County last Friday night in four highly competitive quads. In the very strong top quad which had three masters rated over 2300, nobody went unscathed with everyone dropping at least one game. When the dust settled, FM Leif Pressman and NM Joshua Colas were tied for first with 2/3 points each. Each of the remaining three quads were won by players with perfect 3/3 scores. In quad two, expert Alex Eydelman took advantage of his rating advantage (despite stiff resistance) to sweep the field. Guy Colas won the next section bringing his rating back over 1700. Finally, in the final section (the most unpredictable with some unrated players), Al Pinto dominated the section and jumped nearly 100 points! Join us next week and take advantage of our new Tournament Pass to receive membership discounts on our tournaments.